Venetian, 16th-century maroon morocco gilt over boards with border ornament of running animals. An early owner wrote the monogram of Christ (IHS) in rubrics on the upper center of fol. 1; an early inscription in brown ink scribbled on the upper inside front cover; purchased by J. Pierpont Morgan (1837-1913) from Leo S. Olschki in 1912; J.P. Morgan (1867-1943). Ms. atlas; written and illuminated in Venice, Italy, in 1542. Scribe and artist: Battista Agnese; signed and dated on fol. 13v: baptista agnese fecit venetijs 1542 die 15 mai; the windrose is not believed to be by Agnese. Decoration: 1 illuminated windrose, 1 illuminated zodiacal circle; 1 full-colored world map with 12 blowing wind heads; 9 other maps with details in colors and wash gold. Between 1536 and 1564, the heyday of Italian mapmaking, the cartographer Battista Agnese produced in Venice a number of remarkably accurate and beautifully decorated nautical or "portolan" atlases. About seventy copies are known to exist today. A luxury item, the atlas was unlikely to have been used in practical navigation and was reserved for rich merchants and high-ranking officials. 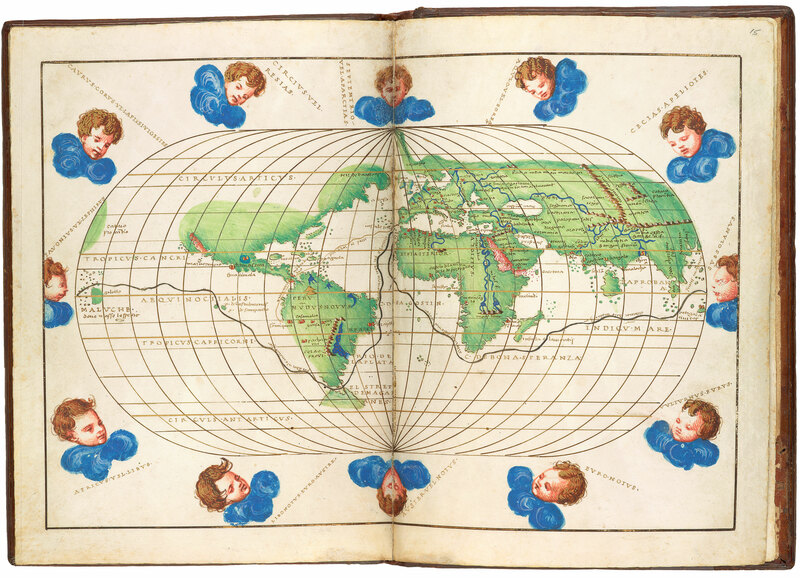 The map with twelve wind cherubs traces Ferdinand Magellan's sea route for his near circumnavigation of the world (he died before completing it) in 151922 along with a route from Spain to Peru. The oval depiction of the world represented a new type of map introduced by Benedetto Bordone's Isolario (Book of Islands).